Los Angeles was founded on September 4, 1781 by a Spanish governor named Felipe de Neve. Los Angeles hosted the Summer Olympics in 1932 and 1984. Los Angeles is sometimes referred to as the "Creative Capital of the World," as so many of its residents work in a creative industry. Los Angeles is home to more than 800 museums and art galleries. The greater Los Angeles area has more than 100 golf courses. Los Angeles is many different things in one. The city is actually divided into more than 80 districts and neighborhoods. Among its different areas, Los Angeles offers a level of diversity that most cities simply can't match. This is also a place where fantasy and reality often go hand in hand, thanks largely to the resident TV and film industries. The city's role as an entertainment hub began to develop in the early 1900s, and by 1921, Los Angeles was home to more than 80 percent of the world's film industry. By 1930, the city's population surpassed the one million mark, and in 1932, Los Angeles hosted the Summer Olympics. Following the end of World War II, Los Angeles experienced another rapid period of growth, and today, the sprawling city boasts more than three million residents. Los Angeles has so many attractions that you would arguably need a lifetime to fully take it all in. The city's museums and art galleries alone total more than 800, and significant landmarks seem to lie around every bend. Among the many notable museums in Los Angeles are the Los Angeles County Museum of Art, the Getty Center, the California Science Center, and the Petersen Automotive Museum. Important landmarks include the Hollywood Sign, the Griffith Observatory, the Dolby Theatre, the Los Angeles Memorial Coliseum, the Capitol Records Building, the Hollywood Bowl, Dodger Stadium, the Cathedral of Our Lady of the Angels, and the Staples Center. The list goes on and on, and of course no trip to Los Angeles would be complete without taking a stroll along the Hollywood Walk of Fame (pictured). Parks, gardens, and a zoo are just some of the other things that you will find in Los Angeles, and when the weather is nice, which it usually is, spending the day at the beach can be a tempting proposition. Is there a city district anywhere in the world that is more famous than Hollywood? 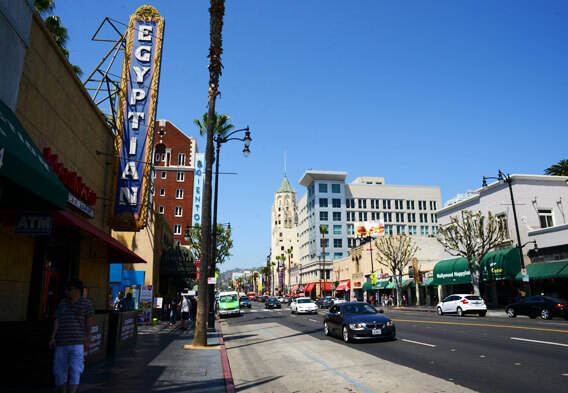 The longstanding epicenter of the motion picture industry, Hollywood may of shipped many of its movie studios to other parts of town, but it still retains its status as a place where young hopefuls dream of making it big and tourists come to explore. Among the main attractions in Hollywood are the Walk of Fame, the Grauman's Chinese Theatre, and the Kodak Theatre. 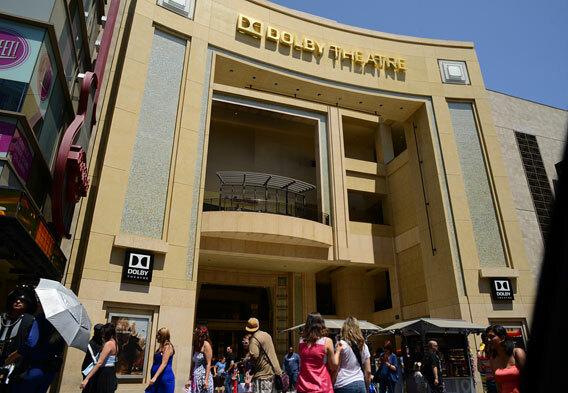 Visitors can also check out the Hollywood and Highland complex, which offers shopping and entertainment, and there are plenty of Hollywood restaurants and clubs to consider. Tip: while in Hollywood, you can head south to the Mid-Wilshire district, where such attractions as the La Brea Tar Pits and the Petersen Automotive Museum await. You are also encouraged to venture to the northernmost part of Hollywood, as this is where you will find one of the country's largest urban parks - Griffith Park. Found within Griffith Park are the Griffith Observatory, the Los Angeles Zoo, and the outdoor Greek Theater. Many Los Angeles visitors make it a point to spend some time in Santa Monica. Being that this is Los Angeles's premier beach community, it is also a popular place to stay. Stylish oceanfront hotels can be found in Santa Monica and provide excellent lodging options, especially in the summer. It is worth noting that in the summer, the Santa Monica beaches can be a good 20 degrees cooler than the city's hotter, inland areas. When Santa Monica visitors aren't relaxing on the sand, they can stroll along the Santa Monica Pier or mix shopping with people watching at the Third Street Promenade. 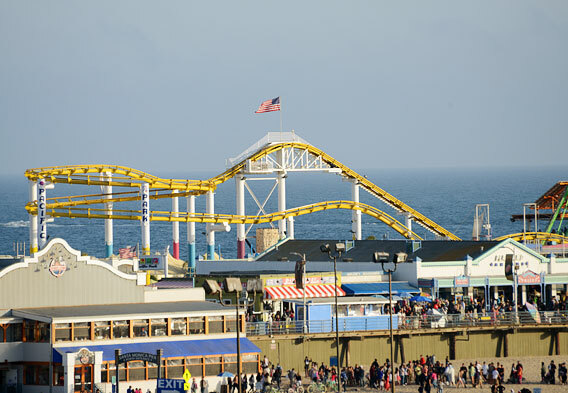 The Santa Monica Pier opened in 1909 and features various attractions, including the family amusement park that is Pacific Park. As for the Third Street Promenade, it is a pedestrian-only outdoor mall that boasts dozens of shops and restaurants. It is also known for its street performers. As is true of the Los Angeles attractions, the city's hotels are almost too numerous to count. With so many to choose from, there are options to suit virtually every taste and budget. Basically, it comes down to how much you want to spend and which area you want to call home while in town. Santa Monica is a good fit for beach enthusiasts, while Hollywood caters to those who want to indulge in nightlife and the neighborhood's renowned attractions. If luxurious Los Angeles accommodations are what you seek, then the Westside and Beverly Hills area is the best region to target, and thanks in part to the Ritz-Carlton at 900 Olympic Blvd., the downtown district is more attractive than ever. Some of the more affordable Los Angeles hotels are found near the airport, and family-friendly Universal City can also be a good place to get reasonable rates. West Hollywood also deserves mention because of its wide range of hotels and motels. 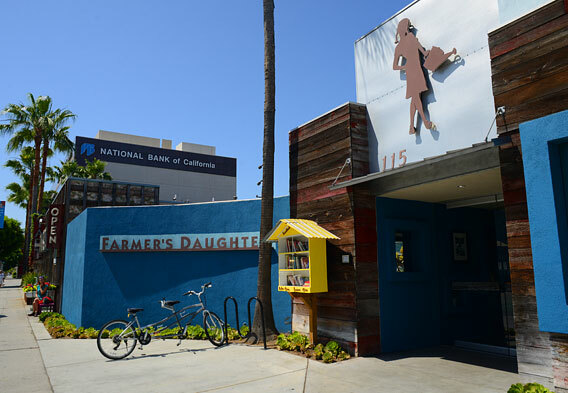 Pictured is the Farmer's Daughter Hotel, which borders Hollywood/West Hollywood and Beverly Hills.